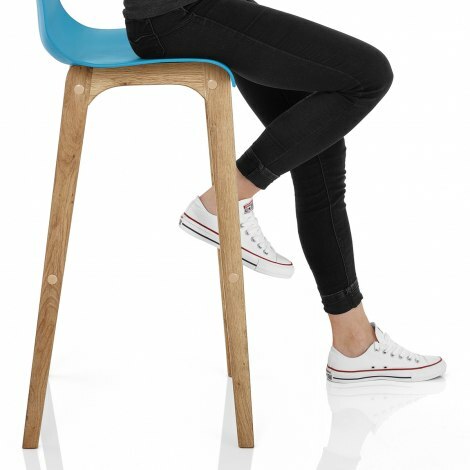 The Drift Oak and Blue Bar Stool adds a modern splash of colour to your bar area. The retro yet rustic design of the Drift will be a great focal point in a minimalist kitchen and will create a funky contemporary contrast in more traditional settings. 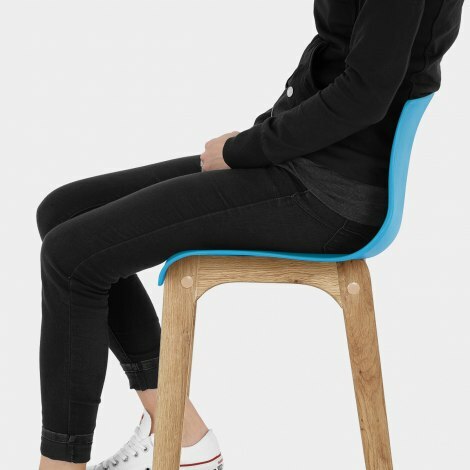 With a bold blue matt resin seat that is smoothly curved for your comfort, the medium height backrest also provides ample support whilst seated. The seat cascades down to the frame for a flowing design. A solid oak frame gives a natural and classic quality to the stool and has four legs and built in footrest for stability. Fixed at kitchen worktop height, it is a suitable accompaniment to a variety of bar areas. "Chairs are very comfortable and look great"
We have bought three different coloured stools for our new kitchen and are really happy with them. They are comfortable for both adults and children. The seats are stylish, really wonderful colours (blue, yellow, grey) not too bright which is exactly what we wanted. The oak is high quality and they are super sturdy. Slightly more than we wanted to pay but totally worth it. 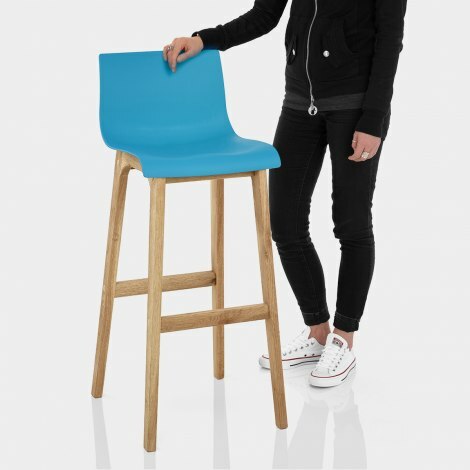 Ordered two for the drift oak and blue bar stool for my kitchen breakfast bar, look fab! Great product, easy to put together and very retro, which is the look I wanted. I would order from Atlantic again good customer and delivery service. Fast and efficient service yet again from Atlantic Shopping. This latest stool completes my set of 6 bar stools and everybody loves them! I bought 3 of these in 3 different colours to sit at the peninsula. They are sturdy and the colours are lovely. Prompt delivery. Chairs are very comfortable and look great!